The January program page will take you through the middle of next week. Then the February page takes over. This past week, a large (I mean, person-sized) rye straw basket made its way home from Harrisburg to Ephrata. 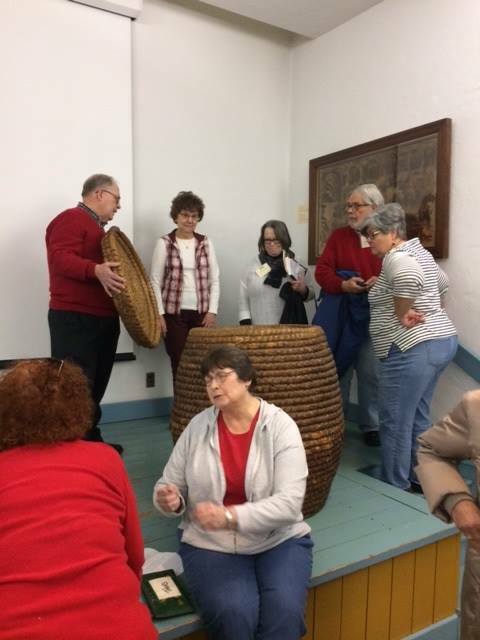 It had lots of help from the staff of the Historical Society of Dauphin County (HSDC), where it had been living, and Ephrata Cloister, where it has now taken up residence. 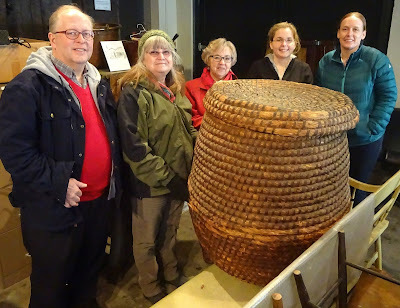 The basket's history traces back to the Gorgas family, prominent householders in the Ephrata community (they weren't living with the celibate brothers and sisters of Ephrata but worshipped and conducted business with them). Many thanks to HSDC for this important donation. Last weekend, the Anthracite Heritage Museum marked the 59th anniversary of the Knox Mine Disaster with a program that included speakers Bob Wolensky, Erika Funke, and David Brocca and musician Lex Romaine (see a preview of Brocca's forthcoming documentary film). I'm told it was standing room only for this annual event, which remembers the 12 miners who died when the Susquehanna River broke through the roof of their mine and the 69 others who escaped. This one's really random. 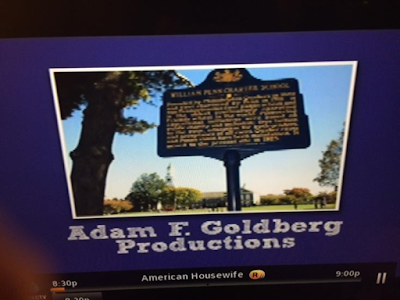 Wednesday night's episode of The Goldbergs (a sitcom set in 1980s Jenkintown, PA) ended with a shot of a PHMC historical marker. If you're not familiar with the show, it's based on creator Adam Goldberg's childhood in the Philly suburbs (and my sources tell me it's extremely accurate). In the show, the Goldberg kids attend William Penn Academy (complete with a mascot wearing a huge William Penn head). 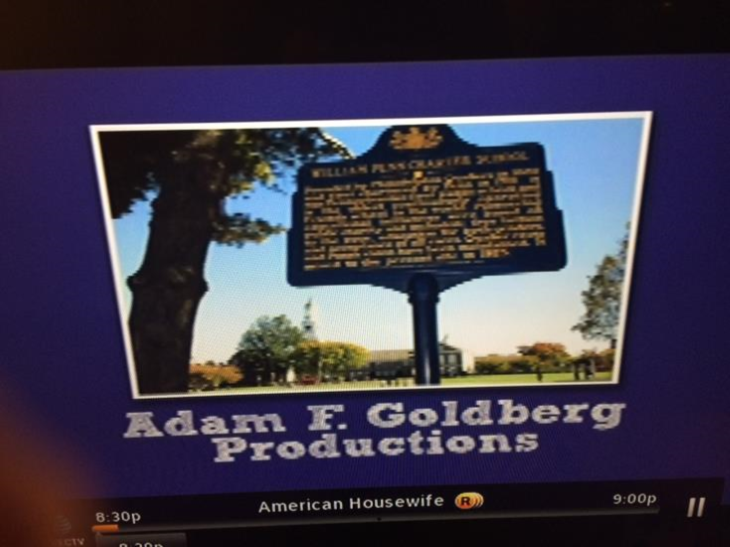 The vanity card at the end of Wednesday night's episode (actually a pilot for a 1990s spinoff that wasn't picked up) showed a photo of the historical marker for William Penn Charter School, which Adam Goldberg attended. The text of the marker reads: "Founded by Philadelphia Quakers in 1689 and first chartered by Penn in 1701, it was Pennsylvania’s first public school and is the oldest continuously operating Friends school in the world. Pioneering educational initiatives were based on public charity and inclusion: free tuition to the poor, education for both genders, and acceptance of all races. Quaker roots and Penn’s vision have been maintained. It moved to the present site in 1925." You never know what you'll learn watching tv. Even more random. 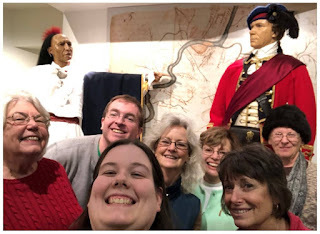 With an eye toward starting a "This Day in History" feature for this blog (sometimes you just have to shake things up a bit) I was trolling around for Pennsylvania history-related events or what-have-you for January 26. On different websites, I found separate but interestingly (to me, at least) juxtaposed items related to Chubby Checker, who grew up in Philadelphia (and appeared on American Bandstand there). On Jan. 26, 1962, Chubby Checker's mega-hit "The Twist" fell out of its #1 spot on Billboard's "Hot 100." On the same day, according to the interwebs, Bishop Burke of Buffalo, NY, declared the song "impure" and banned it from Catholic schools in his diocese. Also on this day, Benjamin Franklin expressed unhappiness over the eagle as America's symbol (1784) and General George McClellan ignored President Lincoln's General War Order #1, which called for a Union offensive (1862). That's it. Have a great weekend! Please check the January program page for information on this weekend's events. Look for the February list (geez, already?) late next week. 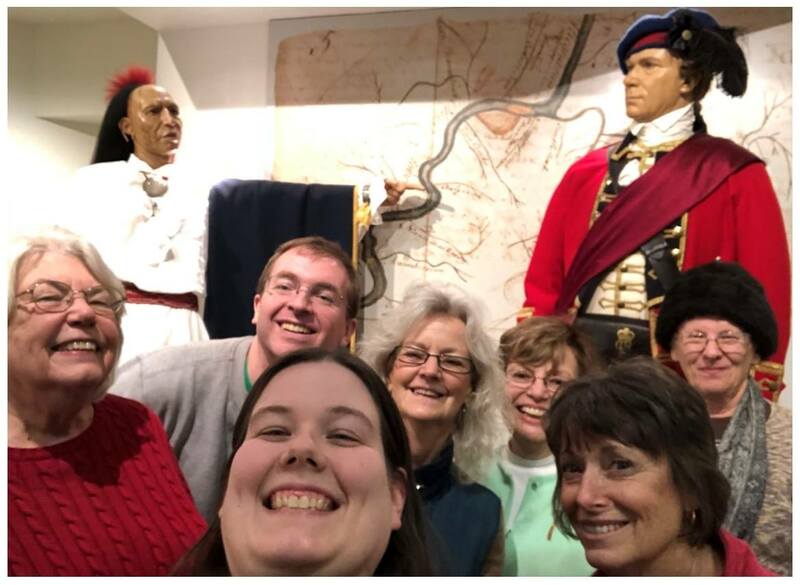 Once again Museum Selfie Day has come and gone (this past Wednesday, Jan. 17). Did you participate? We had lots of selfies on the Trails of History. I've highlighted a few below, and you can find more on PHMC's Twitter account (@PHMC). 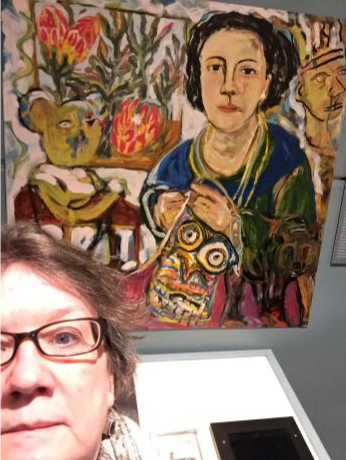 To see selfies from other museums in PA, the U.S., and the world check out #MuseumSelfieDay. An unofficial addition (or prequel) to this year's Museum Selfie Day was the sudden popularity of a new feature on Google's Arts and Culture app. Take a selfie using the app and Google uses facial recognition "mapping" to match your image to its collection of portraits from museums around the world. Some people like their matches, others not so much. I tried it with decidedly mixed results, including one try where it matched me with Frans Hals' Malle Babbe. In addition to providing more ways to take selfies and connect them to museums, the app has also raised a number of issues, from privacy concerns, and more privacy concerns, to whether or not it really helps people engage with art, and the limited scope of matching images for people of color. It's a fairly clear and vibrant illustration of the important conversations going on about representation in museums. Let's hope the conversations continue. The January program page has this weekend's events. Please note that most Trails of History sites will be closed on Monday, Jan. 15, for the Martin Luther King, Jr. holiday. The Railroad Museum of PA will be open (although they are generally closed on Mondays Nov.-March). Last week's post was focused on the various PHMC activities going on at the 102nd Pennsylvania Farm Show. I might also have mentioned the food. The Farm Show continues through tomorrow, January 13, so there is still time to learn about farm technology and agriculture or to search for your family's roots (and eat donuts). 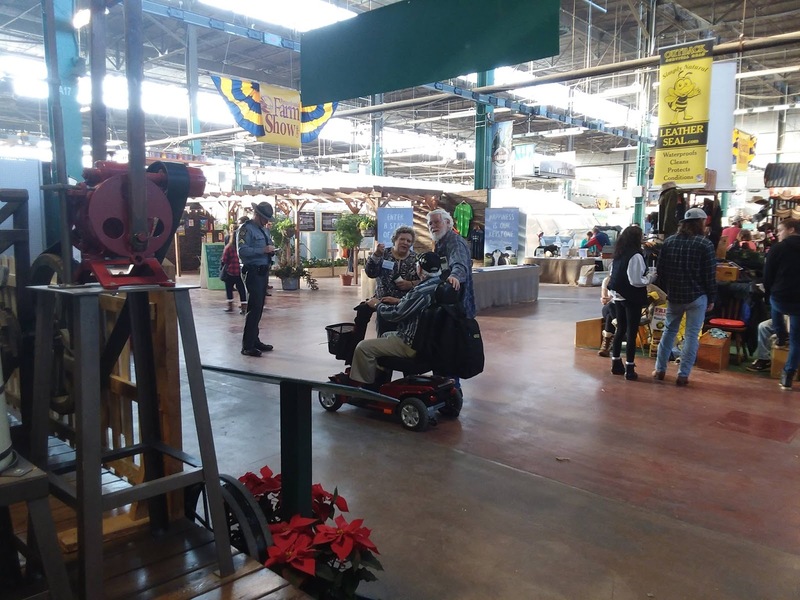 Landis Valley Village and Farm Museum has shared photos of visitors to their booth in the Main Hall, and PHMC posted video of our executive director, Andrea Lowery, demonstrating a piece of farm technology on display. You can also find photos and video of the State Museum's Archaeology display and the State Archives and State Historic Preservation Office "Find Your Story" booth (see below). 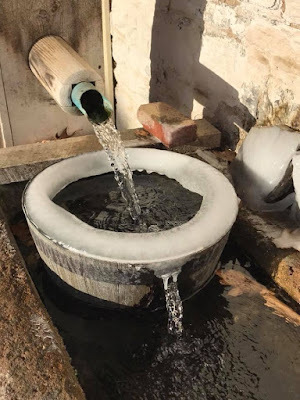 Only because the weather is temporarily warming up am I willing to share this photo of the springhouse at Conrad Weiser Homestead. Although the site is closed to the public for the winter, they are posting periodically. This photo from their Facebook page shows that even though the weather last week was abysmally cold and the water bucket had a ring of ice, the spring was still flowing. I can only image how cold that water felt. Thanks to the Friends of Hope Lodge for the following: "On Wednesday morning, January 11, Historic Hope Lodge was featured on Philadelphia’s NBC10. The Morning Team's 'On the Road' segment was in Fort Washington, Montgomery County, to discuss businesses and organizations that make the area thrive. The short feature included video of both the interior and exterior of the historic mansion and included a brief interview with Friends of Hope Lodge board member and Volunteer Coordinator, Diane Horan, on the role the property played during the American Revolution and video from the annual 1777 Whitemarsh Encampment reenactment." I tried to find a video clip of the Hope Lodge visit but was only able to find the piece that introduced the overall segment (plus their visit to a local Wawa). The Friends provided a photo of Diane being interviewed. And finally a reminder that Museum Selfie Day (@MuseumSelfieDay) is coming up next week. On Wednesday, Jan. 17, museums and historic sites around the world will participate in this popular social media event. We're encouraging staff and volunteers at Trails of History sites to take part and hope that our visitors will as well. Please use #MuseumSelfie and tag the site and @phmc so we can share in the fun. On a related note, the Google Arts & Culture app now includes a feature that matches your selfie to works of art to find your doppelganger. 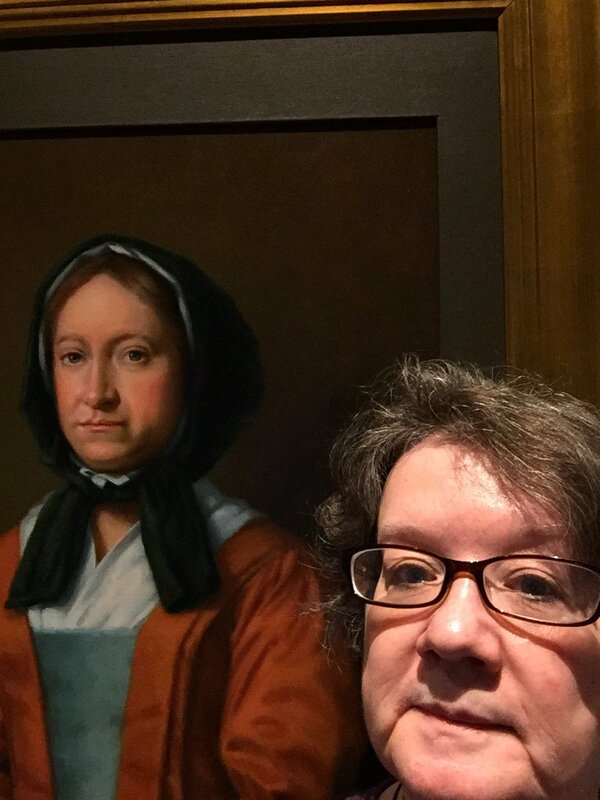 It might be a fun thing to try on Museum Selfie Day. DISCLAIMER: I have not tried the app (yet) and am not responsible for your venture into facial recognition technology. Please check the January program page for info on events. I'll be updating the page as 2018 calendars come online. It's PA Farm Show time (Jan. 6-13)! And you know what that means. Arguments about whether "Farm Show weather" is a thing (given this week's weather - it's a thing). Decisions about which flavor of milkshake to buy. Crises of conscience (crisis of consciences?) about how many potato donuts is too many. And yes, I know, it's not just about the food. There's animals and farm equipment and cooking demos and feats of strength and lots of other good stuff (Farm Show Visitor's Guide). Staff from Landis Valley Village and Farm Museum will be on hand this year with an exhibit titled "Power Technology - Yesterday and Today." The machinery included illustrates the many different power technologies available to individuals in the past and how many of these older technologies are making a comeback. 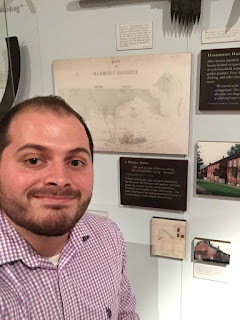 Landis Valley curator Bruce Bomberger told me that the exhibit makes "the comparison with 100 years ago when, like now, there were a number of competing power and energy technologies also jockeying for consumer position. And we talk briefly about the many factors that affect the selection of one power technology over another." The display includes 2 large early 20th-century gasoline engines, a horse sweep, a large model traction steam engine, and a Delco light plant (generator). A wooden tread power is belted to a butter churn; this could have been run by a child or small animal. Other types of machines that were belted to power sources include a corn sheller, fodder chopper, and feed mill. You'll find the Landis Valley exhibit on the west side of the Main Hall (Maclay Street side of the Farm Show Complex) in Booth 607, near the Culinary Connection Stage. On the east end of the Main Hall, look for Booths 691 and 692 (near the carousel) to find other PHMC exhibits. The State Museum of PA Section of Archaeology will focus on "Foragers to Farmers: The development of agriculture in Pennsylvania." Their display includes the ever-popular dugout canoe, a corn grinding activity for children, and recipes for cooking wild foods. Staff from the State Historic Preservation Office (SHPO) and Pennsylvania State Archives will help you "Find Your Story" with free Ancestry.com searches and the Cultural Resources Geographic Information System (CRGIS). The popular Historical Marker Scavenger Hunt will also be in place this year. Read more on the SHPO blog. Please note that the State Archives Search Room will be closed Jan. 6-13 so that all hands can be on deck at the Farm Show. Regular Search Room hours will resume on Jan. 17. To keep up to date with happenings at the Farm Show, you can visit their website, follow them on Facebook, or search the Twitter hashtag (#PAFS18). That leaves just one sacred Farm Show topic we haven't addressed. "But you mentioned the donuts already." Okay, so there's more than one. The butter sculpture - love it or hate it, it wouldn't be the Farm Show without it. Penn Live put together a video of past sculptures (view it on YouTube if the video below doesn't play). If you can't make it in person, you can see this year's sculpture, unveiled on Jan. 4, on the Farm Show Facebook page.